One of the most well-loved saints in the Catholic Church is St Francis of Assisi, a man who has certainly inspired our Holy Father to assume his name at the start of his pontificate. This particular saint deserves mention tonight because there is profound and deep connection between the spirituality of this Saint and the significance of Christ’s coming at Christmas. For the Saint, Christmas had always been the Feast of Feasts, yet he did not think it had been celebrated as it could have been. The poverty of Christ had become lost in the extravagance of the Christmas festivities. 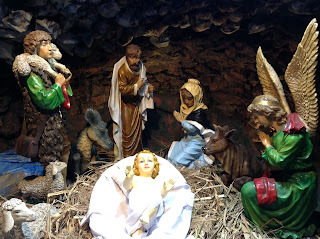 The solution St Francis proposed was not in the form of a profound sermon or complex theology on humility, but a visual homily using the scene of the Crèche or Nativity scene. And pointing to the scene, he spoke to the people about the nativity of the poor King and the humble town of Bethlehem. St. Francis of Assisi reflecting on the Incarnation saw within it the Humility of God and exhorts his followers in this way: “Brothers, look at the humility of God, and pour out your hearts before Him! Humble yourselves that you may be exalted by Him! Hold back nothing of yourselves for yourselves, that He who gives Himself totally to you may receive you totally!” In it he saw humility made real before him, he saw poverty chosen freely, and chose this both for himself and eventually for the brothers and sisters who would follow him. He recognised that poverty flowed from humility and that it was more than just living with less money; it was living in a relationships of solidarity with the poor and the marginalised wherever they may be. To Francis this is the self-emptying love shown by God in the Incarnation, an act of love and liberation. The story of St Francis and the Crèche highlights one of the unique aspects of the Christian Gospel story, an aspect which is often forgotten, the humility of God. Religion normally allows for a distant deity, not a god who stoops, who comes down, entering human history to be a part of the human situation. A common picture of God or gods is, that of a towering omnipotent, unapproachable presence, indifferent towards human suffering, and in constant need of appeasement. The Christmas story stands in stark contrast to the gods that the human mind has imagined. In the Gospel story, the divine incarnation happens in the most unpretentious place, in a stable. God shocks us, surprises us and even scandalises us with His Humility. On this Christmas night, the invisible Deity is made manifest in the visible humanity of one born of a mortal woman; the omnipotence of the second person of the Godhead condescends to the vulnerable weakness of a child. Today is the great Solemnity of Christmas, the great Feast of God’s Humility, the feast of God’s love incarnated, en-fleshed in the humble birth of a child in Bethlehem. Today, we encounter the God of humility in the radical humility of Christ. The beauty of Christ’s humility on this feast day reveals as much as it conceals. He demonstrates through his own birth, the meaning of humility, which is to “give up everything that does not lead to God.” This is a necessary reminder especially when humility is no longer in vogue or respected. Instead, it is held in contempt. Humility is often regarded as a sign of weakness and even stupidity, a lack of prudence in an age that demands street wise tactics and an ego the size of a football field in order to survive. Thus, humility revealed as the pathway to God is concealed to our modern senses. Today’s world would have pooh poohed the path taken by God two millennia ago. The capacity to change and influence the world requires a whole list of factors missing from the Christmas story: wealth, power, a degree from a prestigious university, hide as thick as a rhino, success, achievement, a proven track record, connections with the right people, a magical public relations team and lots of media promotion. Today, the humble often go unnoticed and are deemed insignificant. They make no impact on our lives and hardly warrant a flicker of our attention. The role models of our society are not the humble, but the selfishly ambitious, the proud, the arrogant. The people that our society looks up to – businessman, politicians, sports heroes, actors and actresses, singers, entertainers – they all tend to have one thing in common: a very high regard for themselves, a cocky self-confidence, an insatiable ego and ambition, and a great talent for self-promotion. But let us now consider the humility of the Incarnation itself. The Son of God gave up his honour and glory, he let go of his position, he relinquished all of the riches of heaven, in order to become one of us, in order to save us from our sins. He gave up that glory in order to become a human baby, a helpless little infant. And here’s the irony of it all. God did not only take on frail human flesh and made Himself dependent upon the man and woman he created to now take care of him. Those hands which had formed galaxies and set the stars in place, those hands that had spun the earth on its axis, now just waving around, ineffectually. The mouth that had spoken the universe into existence, now just babbling and cooing. The sovereign Lord of creation, had now become the very picture of weakness and powerlessness and inability – a little baby. Not even a royal baby, not the son of a king; not a wealthy baby, the son of money and privilege. But instead, a peasant child born to poverty and want, raised in very humble circumstances. Surrounded not by God’s holy angels and the glory of heaven, but instead surrounded by sinful, fallen human beings (with the exception of his immaculately conceived mother) and a stinking, dirty barn. But Christ’s humility didn’t end with his birth or his childhood. It continued throughout his life. So, how do we come before him on this Christmas night? What can we offer to him who created the universe and gave us everything we possess? The answer is this: we come to him in all humility, we come to him with nothing to offer but ourselves, when we have learnt how to “give up everything that does not lead to God, and all our worldly ambitions.” Thus, the only way in which we can truly come to encounter our Lord on this Christmas day, is to adorn the garment of humility and condescend to where he has chosen to lay his head for the night. If we want to restore Christmas to our culture, it will require more than just good intentions; it would require radical humility. We will need to give up seats on the pews or places in line. We will need to show grace, even when grace is not given. We need to make peace and offer forgiveness to those who have hurt us. Mercy instead of getting even would be the language of humility. We will need to humble ourselves and follow the example set by the baby in the manger, the shepherds in the field, and Mary and Joseph as they agreed to God’s plan.